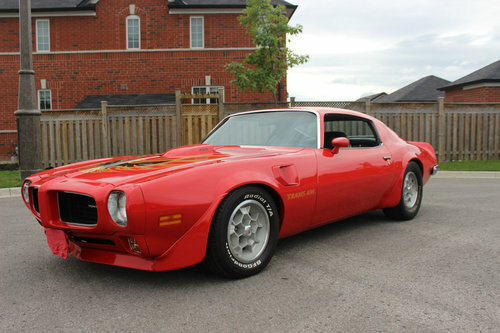 1973 Pontiac TRANS AM 455 with manual 4 speed transmission. The car is numbers match and restored with great detail. Its completely original body, chassis and floors were rust and damage free before the restoration was done. options and color combination it might well be one of a hand full build True Trans Ams. The underside of the car is also highly detailed and correct and everything there, from brakes to steering and suspension systems are rebuild. The car is equipped with its number matching engine and trans and both are rebuild to stock spec's and the engine bay is also detailed and correct. 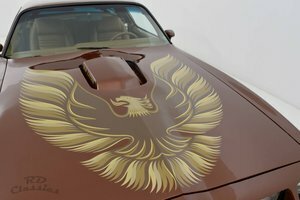 The 73 Trans-am is a unique car as it was the first year of the famous bird decall on the hood, but also the last year of the elastomeric front nose cone and small chrome rear tail lights. 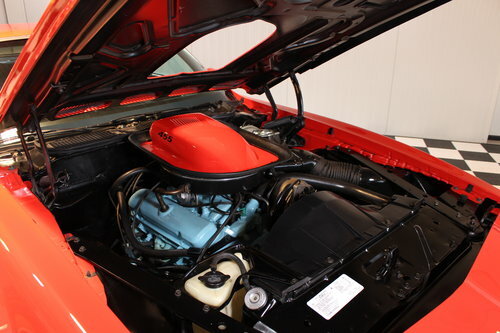 It was also the last year of the high output 455 engine. The paint on the car has a beautiful shine and all emblems and decall's and trim are in concours condition, and so is the complete car. Its equipped with power steering , Power front discbrakes, black bucket seat interior and has the rare factory floor console, rear window defogger, honeycomp wheels and AM/FM stereo all as factory original options. 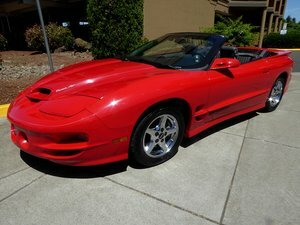 Thank god the car lack of air conditioning in this car, as with purists of 4 speed Trans-Am's that's a no go !. The fact its a true 4 speed car makes this car fast and great fun tho drive and enjoy. 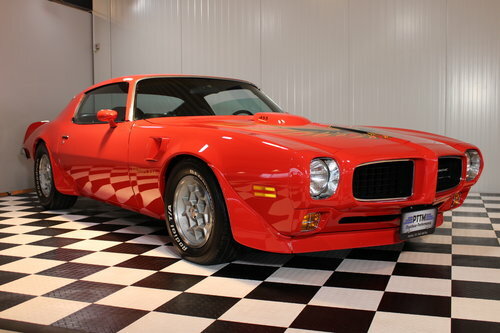 These Trans-ams are absolutely one of the best handling and steering cars of there day's and the are becoming very rare indeed, especially in this original condition. Its only these last few years that people start understanding these great cars with there wings and spoilers which were ahead of there time. 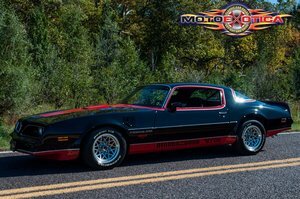 That combined with there great high torque 455 large displacement engine's and pontiac's famous Tuned suspension systems made them way ahead of there time. 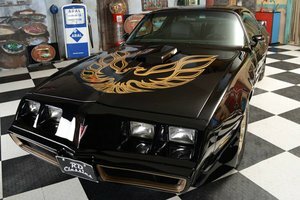 These Trans-ams were unique and out performed almost all other cars back in the 70's. 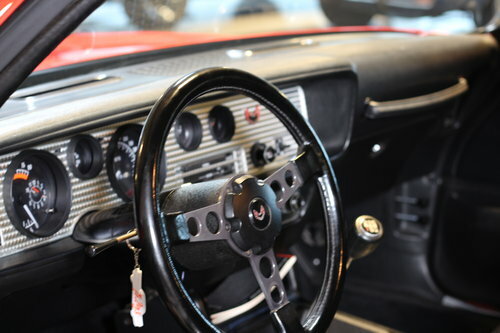 No costs were spared to bring this car up to standard and it comes with its correct PHS and history doc's to prove its pedigree and factory original status. This combined with its great color combination and it being a non airco, real manual 4 speed car makes it highly desirable and collectible. 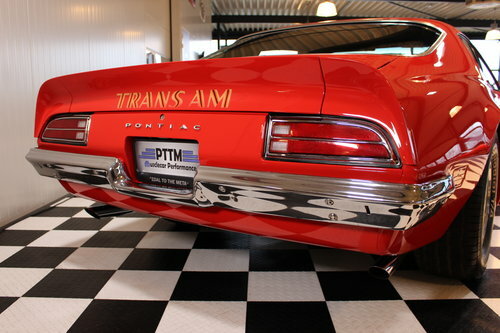 Prices of real and correct Trans-ams will keep ricing for years to come, just like the did for the last decades. So if you want one of these great cars, don't wait to long as the 100k marker will be reached in the future for sure.